Just near the gompas and mandirs of the pilgrimage site Muktinath-Chumig Gyatsa one can find another two Tibetan Buddhist gompas: Garwa Gompa and the above Tharpa Choeling Nunnery. 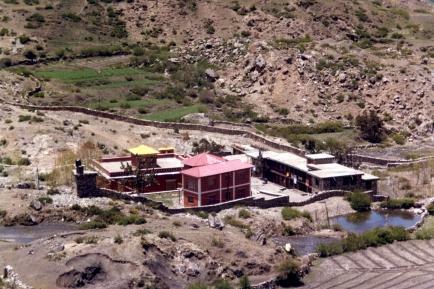 Tharpa Choeling Nunnery is located at one of the places where the great Tibetan Buddhist yogi Shangpa Rinpoche stayed and 'turned the wheel of Dharma'. Last century he built many monasteries and stupas in the area. Shangpa Tulku Rinpoche (1960) is recognized as his reincarnation. Many of the current practitioners and lay devotees were his past life disciples, including the Mustang King Jigme Palbar Bista. It was under his invitation that Shangpa Tulku Rinpoche made his first trip back to Muthinath in March 1994. At that occasion a piece of land near the pilgrimage site Muktinath was donated to Rinpoche, where Tharpa Choeling Nunnery now stands. The nunnery consists of a gompa (shrine hall), nuns quarters and a retreat room for abbot Shangpa Rinpoche. The ground breaking ceremony was held on 13 July 1995. The construction of the nunnery has been completed and the opening ceremony was held on the 4 October 2000. Presently, there are about 24 nuns from Muktinath Valley staying at this nunnery. Beside their religious education the nuns living at Tharpa Choeling get a sound general education. At this moment local tradition seems to prevent the setup of one educational centre for the general education of all the Buddhist nuns present in Muktinath Valley. The MFI hopes this will change when time goes by. Meanwhile the setup of the Kagyu Tharpa Choeling Nunnery proves that for good general education the mountain women can stay in their own local social, cultural and religious enviornment. Tharpa Choeling Nunnery is sponsored by The Shangpa Foundation. You can make a donation via Paypal. For more backgrounds on the nunnery of Shangpa Rinpoche, please click here.